I woke up this morning still hearing the music in my head. My feet ached and my head was still filled with all the music from last night. I had a butterfly drawn on the back of my neck and flowers starting from my ankles and going up my left leg. My youngest cousin, Salma, was getting married, her wedding is in two days and her henna night was last night. It was one of the funniest Henna Nights I’ve attended. 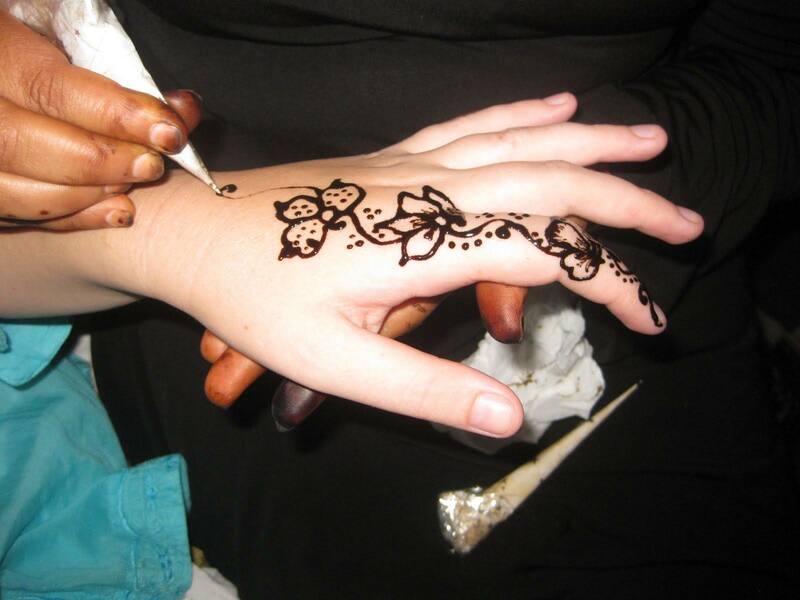 Henna Nights are usually intimate with the closest friends and family of the bride and usually the mother in law and sister of the groom are invited. Only women attend and my uncle and my cousin’s brother were not anywhere to be seen. 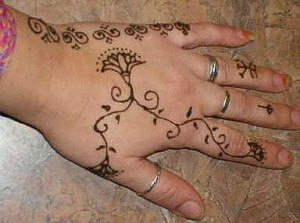 The use of Henna is very popular in the Egyptian countryside for brides and older women when their hair starts turning white. As we went up the stairs to my uncle’s apartment we could hear the loud dancing music. The apartment door was open and as my mother and I walked in, we saw Salma and a couple of her best friends belly dancing to the music. She was wearing a pretty white galabeya with red stripes and a cute head scarf with shimmery coins hanging on it from all sides. Everyone was barefoot and soon I took off my shoes too and joined the fun. Half an hour later all my other cousins had arrived along with the rest of my cousin’s friends. We moved all the furniture against the wall to make room for all the people dancing. The veiled ladies took off their scarves and even my aunts and other elder ladies joined in the dancing. Salma had put a lot of preparations into her costumes. She changed three times that night. For fun, she and her best friend had gone down to the Khan the day before and bought some belly dancing costumes. Her first attire was the white and red striped galabeya, and then there was a two pieces one with a wrap skirt and a shimmery top, then the third one was the real belly dancing costume with the thick waist belt, flowing skirt and jingly bra. The music was really good to got us all in the dancing mood, but eventually we all took a break when snacks were offered and the lady who drew with the Henna had arrived. 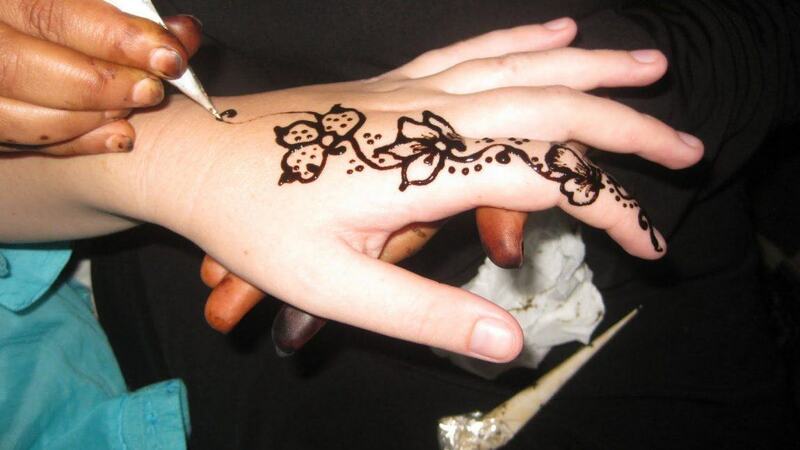 Henna is actually good for the hair and is applied to give it a red glow, and it is also used to tattoo brides. This is a tradition that is popular in the gulf countries and in Egypt and Sudan. The lady mixed her Henna and put it in a small cone with a tiny hole at the bottom; much like the one used to decorate cakes, and drew on our shoulders, legs, arms and feet. Flowers and butterflies were very popular themes. After I got my Henna tattoo, I enjoyed some of the snacks which were traditional vine leaves stuffed with rice, some sandwiches, tahina and yoghurt dips, salads and yummy chocolaty desserts. Eventually we resumed dancing again, however a little bit past midnight I was getting tired and sleepy. My cousin was still dancing on the table and the party was still full swing. I saw my mother also yawning at a distance. We said goodnight, wished every one well and left. I know that in the wedding in two days it will be obvious who will be the closest ones to the bride. We all had tattoos to show it.